I grow sugar snap peas each year, both bush and pole peas. My kids and husband love to eat them raw right out of the garden. I like to eat them slightly cooked, there just some bitter flavor I can taste in the raw peas that the rest of my family can’t. I know my taste buds can be a little weird. So, when I have an overabundance of peas, I like to combine them with a few other vegetables and freeze them into stir fry vegetable freezer packages. These stir fry freezer packages work great with my marinated chicken stir fry packs to have a meal just waiting in the freezer for me to make. I can usually purchase fresh broccoli and cauliflower for about $.80/lb. When I see a good sale I will pick some up and add that to my stir fry packages. If I don’t find a good sale I usually have carrots, onions and celery on hand to add to the sugar snap peas for the freezer packages. 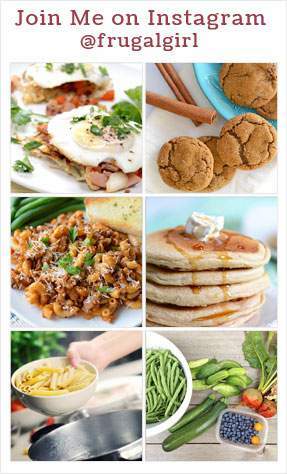 You can use whatever vegetables you like best in your stir fry. 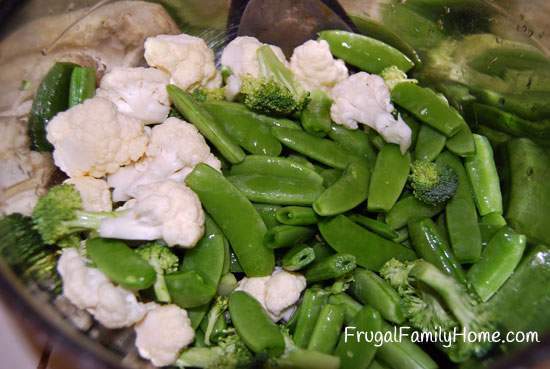 Wash and cut up the vegetables as you would for stir fry. I chunk up the cauliflower and broccoli. For the sugar snap peas I removed both ends with the strings. I also peel the broccoli stalks and slice them up too. Don’t throw them away there are great to use. My kids call them broccoli chips. Once the vegetables are all prepared, I blanch them for about 3-4 minutes in boiling water. You don’t want to cook them through just blanch them. After blanching you will want to cool them down quickly to stop the cooking. 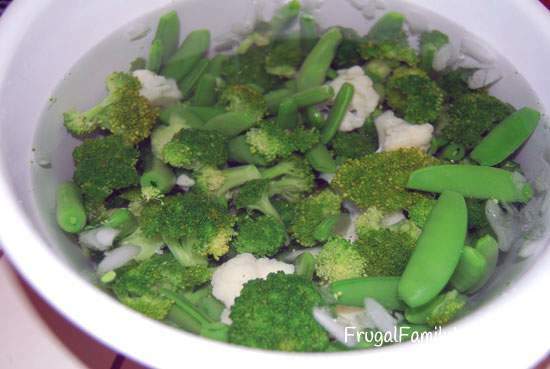 Add the blanched vegetables to a large bowl of ice water. Let them cool about 3-5 minutes. 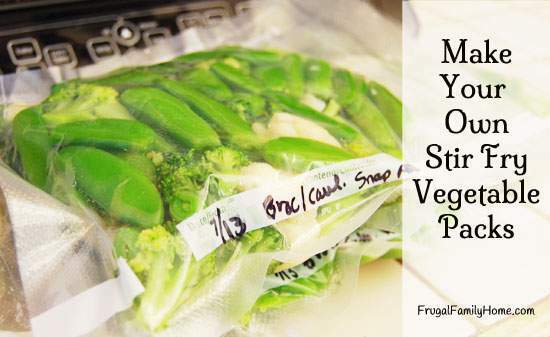 Once the vegetable are cool, drain and package into vacuum bags or zipper freezer bags. Make sure to label them with the date and what is in the packages. To use the stir fry vegetable packages, I thaw them slightly and then add them to the skillet and stir fry. 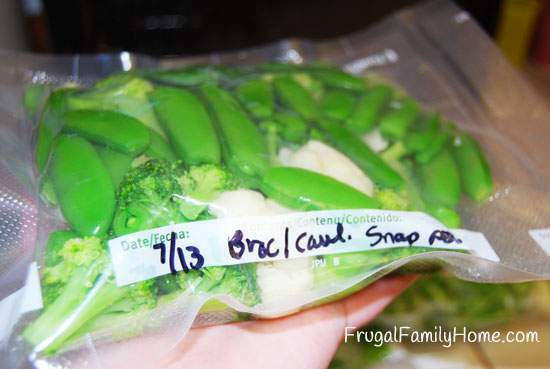 Having these packages in the freezer makes getting a stir fry dinner on the table so very easy. Also by purchasing the vegetables while they are in season you can save money too. 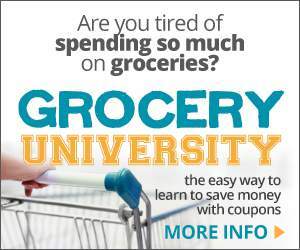 Having convenience and money saving is a good combination. Great post! We love to save our garden peas for the exact same reason! Always great to have an easy garden meal just waiting for us in the freezer. One thing we do differently is putting all the blanched veggies on a cookie sheet first and freezing them flat. That makes it easy to get them out of the bag and to use a smaller portion if there happens to only be two of us. That’s a great idea to flash freeze them so they don’t stick together. Thanks for stopping by. It’s so nice to have food we’ve grown in the freezer for later. But you are right you need the freezer space. I know investing in a freezer has really paid off for our family. 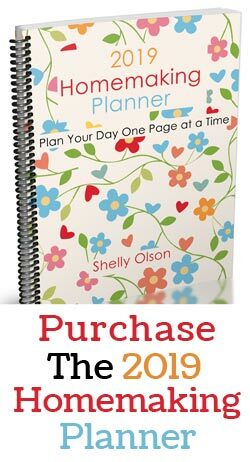 This seems like such a good time saver! Love this. I want to do this with all my veggies I grow for winter. Thanks for sharing!! Your welcome Christine! I hope you have a bountiful garden this year.